Halve and peel the squash. 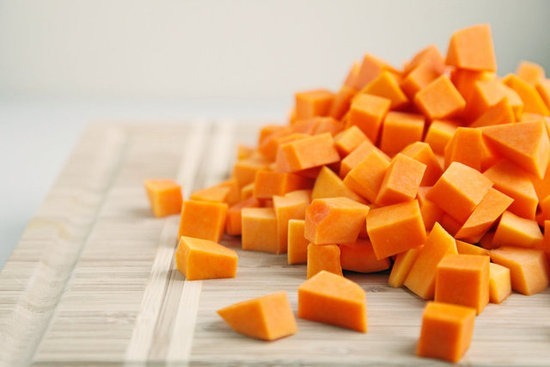 Remove the seeds and cut the squash into 1-inch chunks. Heat the oil in a Dutch oven over medium heat. Add the onion and cook for 5 minutes. Add the garlic, cayenne, cinnamon, nutmeg, and ½ teaspoon of the cumin and cook for 1 minute. Stir in the squash, tomatoes, raisins, broth, chickpeas, and 1½ teaspoons of the salt. Bring to a boil. Reduce heat, cover, and simmer for 10 minutes. Uncover and cook until the squash is tender, 15 to 20 minutes. Meanwhile, in a medium saucepan, bring 1½ cups water and the remaining cumin and salt to a boil. Stir in the couscous. Cover, remove from heat, and let stand for 5 to 10 minutes. Fluff with a fork.